BROCKTON — “Sounding,’’ an imposing sculptural work by Donald Fortescue and Lawrence LaBianca, could be an old phonograph that has mutated into a giant undersea creature. It stands in the middle of the first gallery of “The New Materiality: Digital Dialogues at the Boundaries of Contemporary Craft,’’ a vigorous exhibit about the crossroads of handmade and new-media work at the Fuller Craft Museum. The base of the piece resembles an elegant, cabriole-legged side table, but it’s a rusted steel cage filled with rocks. An enormous, ivory-toned amplifying horn sprouts from that cage and curves gracefully down over the viewer’s head. Stand beneath it, and the sounds of water lap and gurgle down upon you. To make it, Fortescue and LaBianca submerged their steel sculpture underwater for two months — hence the rust — and recorded the sounds at the site. It’s the perfect centerpiece for the show, organized by independent curator Fo Wilson. “Sounding’’ is, with its rocks and rust and elegant funnel, materially delicious, and formally it refers back a century or more to the heyday of handcrafted objects. But the digital sound element is nothing anyone can touch, and its damp, ethereal murmurs clinch the work’s success. “The New Materiality’’ rightfully asserts that the paradigmatic divide between handmade and digitally produced is artificial. Heaven knows many artists work both sides of that street. The separation has been even more entrenched in craft circles, where, as Wilson points out in an essay in the show’s catalogue, the emphasis rooted in the Arts and Crafts movement of the late 19th century was on handcraft as a counterbalance to the anonymity of industrial production. More recently, we have seen a resistance by some to technological innovation in favor of traditional techniques. As life grows ever more virtual, beautiful material objects and handwork have renewed their cachet. But the tactile delights of the handmade don’t have to preclude high-tech elements. When the virtual intersects with forms and materials we associate with craft, as it does in this show, there’s friction. Sparks fly. Look at “Table I: Murmur,’’ by Susan Working and E.G. Crichton, which on cursory examination appears to be a sleek wooden table. Then notice two small videos embedded in the tabletop, side by side near one end. Black-and white scenes of an aspen forest swim silently across the monitors, as if to remind viewers of the table’s source. As the scenes speed from a meander to a rush, note that the table’s surface is slightly tilted, and the video imagery appears to be rolling downward. The introduction of new media into a simple table doesn’t merely didactically return us to the woods; it challenges and expands our imaginative experience of the table. Correlations between the digital and craft worlds are plentiful. Weavers Lia Cook and Christy Matson remind us that the loom’s warp and weft is a binary system, upon which they plot digital information. Cook’s “Face Maps Revisioned: Lips,’’ made on a digital Jacquard handloom, a close-up of lips naturally pixilated by the weave, blurs into abstraction as you near it. Matson plotted sound data from three sources onto her textiles, charting the noise from a hand-operated loom, a computer-assisted one, and an industrial loom, carping like a good craftsperson about technology’s noisy inhumanity, even as she uses it. Nathalie Miebach sees data as her primary material. She records weather and tidal details on the grid of a woven basket in “Boston Tides.’’ It’s a fantastical structure with a U-shaped, undulating tubular basket bracing a grid of orange wooden rods, packed with information that, presumably, a meteorologist could decipher. Brian Boldon’s wickedly clever glass piece “3-D Chair’’ toys with a particular type of visual information: the digital image, this one of an old office chair. 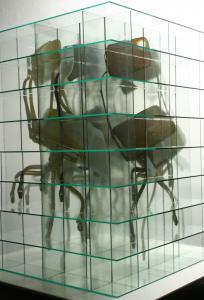 Boldon resurrects the chair in three-dimensional space by creating a 3-D glass grid with decals of the chair. It’s still a flat image, but it stutters through space, fracturing and repeating itself, in a digital regurgitation of Cubism. One of the points of the show is that the boundaries that define art, craft, and new media are porous. Again, that’s not news; contemporary art thrives on crashing through walls. But it still can surprise. Wendy Maruyama calls herself a furniture maker. Looking at her wall pieces, I never would have guessed that; they’re made from wood, but they’re purely sculptural. “Stroke,’’ from her “Kanzashi’’ series, is a gorgeous piece, a 5-foot-tall black-painted comb modeled after those worn by geishas. It’s a monumental comb, black and imposing, and it commands questions about women as ornamental objects. A small, haunting video embedded near the top shows hands stroking black hair and massaging the scalp in a richly mixed message about seduction, comfort, and the cost and benefits to their providers. Most of the work in “The New Materiality’’ rigorously pairs new media with handmade. Occasionally, the concepts behind the works founder. Shaun Bullens’s “Anxious,’’ which features two small videos of a parakeet, one in a cage and the other on a branch, is a simplistic depiction of freedom, especially when the bird on the branch flies out of the frame. But when these craft artists work with nuance to claim information as their own, just as much as wood or glass, it’s a triumphant and belated breakthrough.